“All Through the House” – Joan Collins wacks her husband on Christmas Eve, but faster than you can say instant karma, a murderous nut in a Santa Claus suit comes knocking at her door. “Dead Reflection” – An adulterous lawyer and his mistress get into a traffic accident. He awakens believing that he has survived the wreck, but he soon finds himself gravely mistaken. “Poetic Justice” – Snobbish man tries to run his kindly, old neighbor out of the village, only for the old man to commit suicide. One year later, a vengence comes from beyond the grave. Literally. “Wish You Were Here” – Using a magic Chinese statue, a couple wishes for a fortune, and low (a la Monkey’s Paw) the man is killed. The grieving widow wishes for her husband to return and never to die. Oops. “Blind Alleys” – The cruel administrator of a home for the blind completely neglects his patients. However when one of them dies, the rest devise a fiendish plot for some harsh revenge. Ah, Tales from the Crypt. Long before it was an HBO series hosted by Anna Nicole’s late husband, it was adapted for the big screen. Perfectly capturing the gruesome glee and black humor of the classic E.C. Comics horror series, this is one of the best episodic horror films ever. Anyway, it certainly left an impression upon me as a child. I believe I was five and watched it on TNT one Saturday night. Needless to say, the humor and irony was lost on me as a child, as I was instead terrified by the film. Oh the images that stuck with me all through the years – Santa Claus assaulting a woman, a leather-clad skeleton riding a motorcycle, the ultimate fate of our characters, and (of course) a dead Peter Cushing rising from the grave to rip out the heart of his enemy. These moments stayed with me for many years until I revisited the film when I was a teen, discovering my memories were fairly accurate. 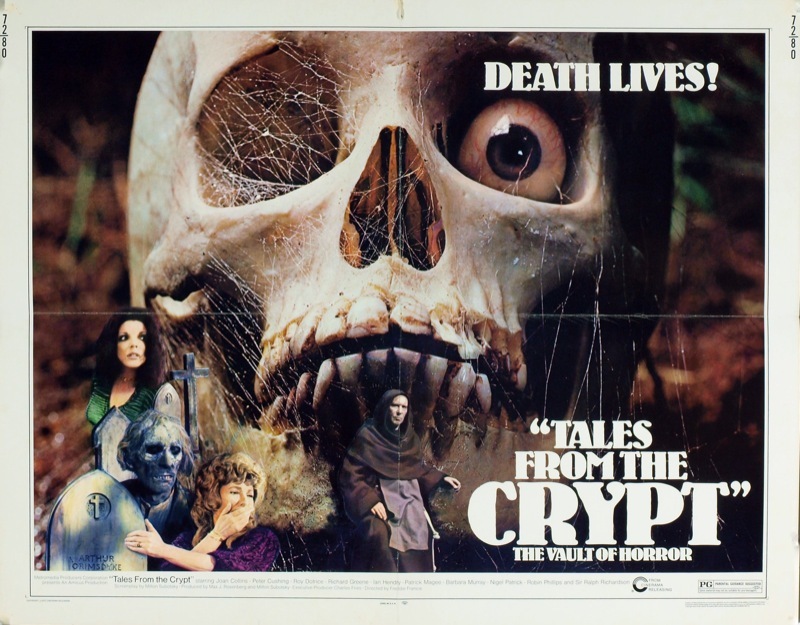 But I digress, Tales from the Crypt is a classic, old-fashioned horror delight. Suspenseful, atmospheric, well-acted, and just slightly tongue-in-cheek; it’s an enjoyable treat for the old school horror fan.